Brenda Leigh Johnson (Kyra Sedgwick) has left the building but that won’t stop her teammates from trying to catch the bad guys — any more than it will stop TNT from trying to attract big ratings. Will Major Crimes be as big a success as The Closer? We’ll have to wait and see. The series’ cast includes Mary McDonnell, G.W. Bailey, Graham Patrick Martin, Kearran Giovanni, Michael Paul Chan, Phillip P. Keene, Raymond Cruz, and Tony Denison. Below are the TV show’s ratings, the best way to tell if Major Crimes will be cancelled or renewed for a second season. There are 10 episodes in the first season and they air on Monday nights on TNT. Final season averages: 0.9 rating in the 18-49 demographic with 5.18 million total viewers. 0.9 demo rating (+29% change) with 5.13 million (+18% change). Season averages: 0.89 in the demo with 5.18 million. 0.7 demo rating (0% change) with 4.33 million (+4% change). 0.7 demo rating (-13% change) with 4.17 million (-3% change). Season averages: 0.91 in the demo with 5.29 million. UPDATE: TNT has renewed Major Crimes for a second season. 0.8 demo rating (0% change) with 4.30 million (-8% change). Season averages: 0.94 in the demo with 5.45 million. 0.8 demo rating (-11% change) with 4.67 million (-6% change). Season averages: 0.97 in the demo with 5.64 million. 0.9 demo rating (-10% change) with 4.96 million (-16% change). Season averages: 1.00 in the demo with 5.83 million. 1.0 demo rating (0% change) with 5.87 million (+2% change). Season averages: 1.02 in the demo with 6.05 million. 1.0 demo rating (+11% change) with 5.74 million (+6% change). Season averages: 1.03 in the demo with 6.11 million. 0.9 demo rating (-25% change) with 5.40 million (-25% change). Season averages: 1.05 in the demo with 6.29 million. 1.2 rating in the 18-49 demographic with 7.18 million total viewers. Season averages: 1.20 in the demo with 7.18 million. It was a great start for Major Crimes but the real test will be what happens in the later weeks of the season. What do you think? Do you like the Major Crimes spin-off series? Do you think it should be cancelled or renewed for another season? 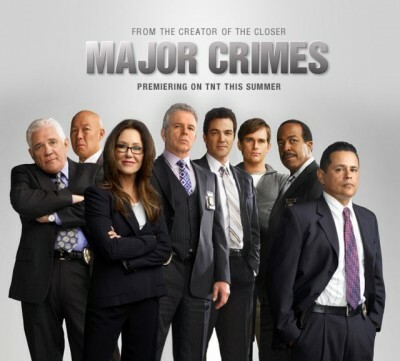 Loved the DVD of Major Crimes, couldn’t stop watching. Did not watch much of The Closer because we had trouble understanding the accent here in Australia! But we definitely loved this one and can’t wait for the next Dvd of the series.